Drink in the lotus, Yodapillar. Breathe in its purity. Out of a mudhole it has grown. Now it floats, gently bobbing on the surface. “Mudhole? Slimy? My home this is!” Soon you will yourself blossom, emerging from a chrysalis, perhaps no longer in physical form. “Luminous beings are we… not this crude matter.” Eating the blossom, chewing on its petals, might speed up your transformation, temporarily boosting your power and expanding your vision, but after nibbling on the edge of the leaf you rear back, looking up while clasping the stem, and in reverence remember: Tat Tvam Asi. 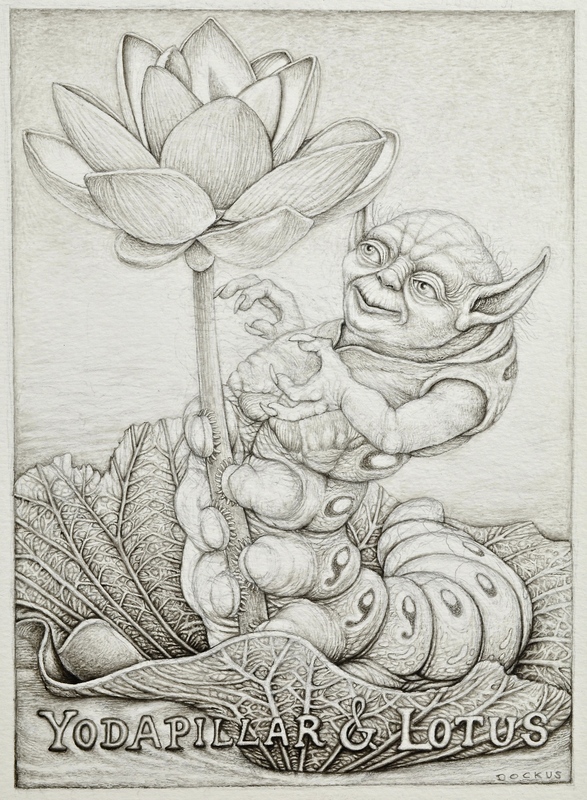 This entry was posted in art, graphite & ink, ink drawing and tagged art, buddha, buddhism, caterpillar, drawing, flower, hinduism, ink, lotus, metamorphosis, transformation, upanishads, yoda. Bookmark the permalink.